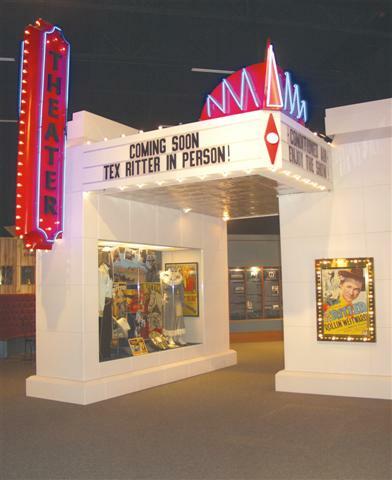 The Texas Country Music Hall of Fame/Tex Ritter Museum opened in August 2002 in a $2.5 million state-of-the-art facility. Since that date, over 30,000 country music fans have stepped back in time to re-live great moments in country music history. Fans have come from every state as well as numerous foreign countries including England, Scotland, Ireland, Denmark, Canada, India, Sri Lanka, The Netherlands, Germany and Australia. 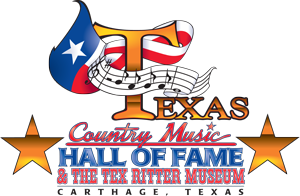 The museum started in 1993 as the Tex Ritter Museum and expanded to include friends of Tex and other Texas-born country music legends. In August 2004, the museum expanded to add a significant Jim Reeves display which features the radio equipment from Jim's radio station KGRI in Henderson. Maurice Woodward Ritter was born on January 12, 1905, the youngest of six children born toJames Everett and Elizabeth Matthews Ritter, ranchers in Murvaul, Texas. His family later moved to Nederland, Texas, ten miles from Beaumont, where he studied voice, trumpet, and guitar as a teenager. He graduated with honors from a Beaumont, Texas, high school in 1922, and enrolled at the University of Texas, in Austin, to study law. Ritter starred on Broadway and worked as a radio star on shows such as The Lone Ranger, Tex Ritter's Campfire, and Death Valley Days. Later he starred in movies for three motion picture industries. Ten years before his death in 1974, Tex Ritter was inducted into the Country Music Hall of Fame in Nashville, Tenn. Tex is also a member of the Texas Country Music Hall of Fame. Ritter's 1953 version of Do Not Forsake Me was the theme song for the Gary Cooper film High Noon. Not only did the song become a popular hit, it also won an academy award. He performed the song on the first televised broadcast of the awards ceremony that year. Some of his hits include: "Jingle, Jangle, Jingle." "I'm Wastin' My Tears On You," "There's a New Moon Over My Shoulder," "Jealous Heart," (1944) "You Two-Timed Me One Time Too Often," (1945) "You Will Have to Pay," "Christmas Carols by the Old Corral," (1945), "Rye Whiskey" and "Deck of Cards" (1948). Ritter's recording career was significantly less successful than his film, radio, and television career. For seven years, Ritter was ranked among the top ten money-making stars in Hollywood. In all, he made 78 films between 1936 and 1948 for such studios as Columbia, Monogram, and Universal. By 1952, he became host of the Southern California country music TV show, Town Hall Party, and also its nationally syndicated counterpart, Ranch Party. In 1961 he had a final big hit with "I Dreamed of a Hillbilly Heaven." In 1970, Ritter unsuccessfully campaigned for a seat in the United States Senate. Ritter joined the cast of the Grand Ole Opry in 1965 and remained a member until his death on January 2, 1974. His son, John Ritter, became a highly successful actor after Tex's death. Tex Ritter landad a featured role in the Broadway play, Green Grow the Lilacs, in 1931. The cast began calling him "Tex" because of his accent and the name stuck with him.